UPDATE: THE AGE OF MEGAFIRES - 60 Minutes September 6, 2009: Global warming is increasing the intensity and number of forest fires across the American West. Resident CBS alarmist Scott Pelley goes to the fire line to report. Watch a preview here. While environmentalists and clueless politicans like CA Representative Linda Sanchez and not surprisingly the opportunist George Soros disciple Joe Romm sought to place the blame for the California wildfires on ‘global warming’. the massive California wildfires can be attributed to a cooling Pacific, two years of La Nina and environmental mismanagement. 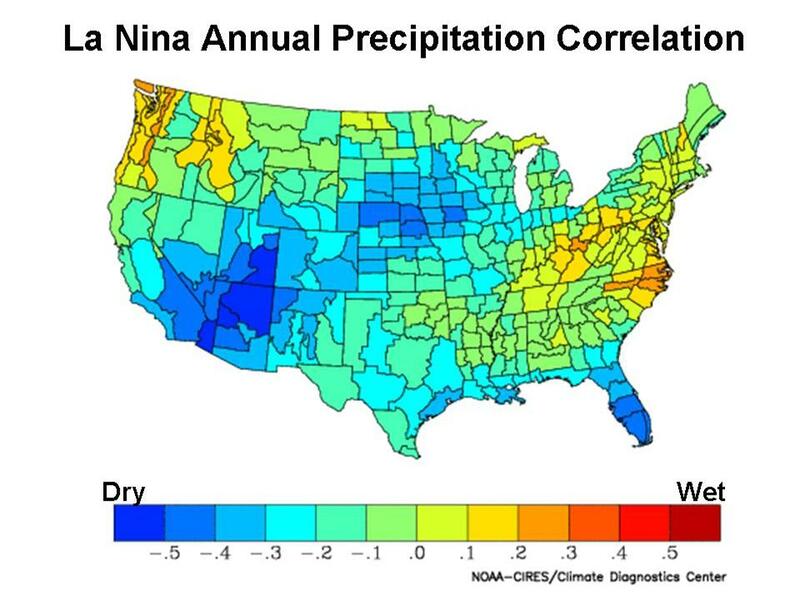 You can see clearly from the following correlation chart of La Ninas (using the Southern Oscillation Index) with precipitation from CDC, that La Ninas favor dryness in the southwest. The basin wide Pacific multidecadal warming and cooling affects the frequency and strength of La Ninas and El Ninos. The cold PDO favoring more, stronger and longer lasting La Ninas and the warm PDO more, stronger and longer lasting El Ninos and fewer briefer, mostly weak La Ninas. 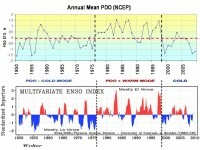 The PDO turned cold in 1998 bounced some until 2006 when it began a significant decline. See the blue La Nina frequency increasing like it did when the PDO was last cold from 1947 to 1977. 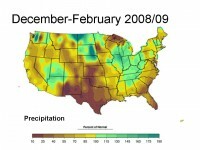 The rapid cooling in the Pacific in 2006 caused the El Nino winter of 2006/07 rains to fail in California. 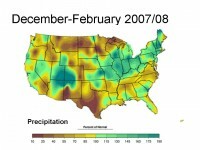 The La Nina that ensued became strong in the late winter and early spring of 2007/08 and came back again for a reprise in 2008/09 winter continued to produce sub normal rainfall. A few years back McCabe, Palecki and Betancourt published a paper that looked at drought frequency across the United States related to both the Pacific Decadal Oscillation and the Atlantic Mulitdecadal Oscillation. 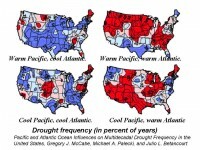 Droughts in the United States were more frequent when the Atlantic was in its warm mode. When the Atlantic was warm, and the Pacific was also in its warm mode, the dryness was more across the northwest and southeast and when the Pacific was cold more across the southwest. Red areas have enhanced drought probabilities. We are currently still have a warm Atlantic mode and cold Pacific mode (D) and thus should expect the increased risk of dryness in the southwest. See these maps and read more here. This natural cyclical lack of rainfall combined with unwise policy that Dr. Scott Campbell reported concerning the prohibition against clearing up accumulated brush from the areas surrounding housing developments that were instituted at the insistence of the Sierra Club and other environmental groups has left more fuel for the fires fanned by the Santa Ana winds. The JPL’s Dr Patzert indicated, in a release, were also more common in La Ninas. The risk is also greater because more people built homes in the cooler hills among the trees, putting more than trees at risk. 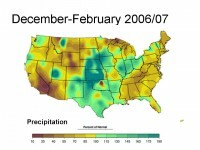 In addition, environmentalists have reduced the amount of water that can be used for agriculture. Farmers in the Central Valley are asking for a new canal to get water from the Sacramento River, as well as a relaxation of environmental restrictions resulting from a 2007 court ruling limiting the amount of water pumped south from the delta - a giant sponge that absorbs runoff from the wetter north. The ruling was in response to a suit by environmental groups that held that the water pumping through the delta endangered several species of fish, including smelt, green sturgeon, and winter and spring salmon. More here. Given the current El Nino is in the cold PDO mode, it should be weak and tend to be brief. It may peak this fall and weaken this winter. The increased tropical activity in the eastern Pacific is favored in El Nino years (in some El Ninos they reach California in the early fall in a weakened state - e.g. Kathleen in 1976). The similar El Ninos in the cold PDO tended to produce normal to below normal wet season precipitation. It is likely a La Nina will return next year. Expect another active fire season. See more here.